Yes, times have changed. But in the case of this popular kiddy treat, not for the better. Frog in a Pond has been an Australian favourite for decades. It was a feature of the menu at Coles Cafeterias and a roaring success at children’s parties. But its history is indeed a chequered one and the DIY version (spotted in the bistro at the Barooga Sports Club, aka Sporties) is a new low. 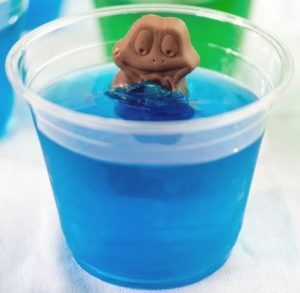 Let’s consider the key ingredients: chocolate frogs and green (or blue) jelly. As seen in Good Food. Note that the frogs in their picture are immersed in the jelly, which is green and pond-like. We’ll forgive them the flourish of the flower on top. And the frogs are…well…frog-shaped. The jelly has remained more or less unchanged since the earliest incarnations of this iconic dessert, with most recipes (we need a recipe?) recommending the watery colours of blue or green. But the central character, the Freddo Frog, has been subjected to a series of indignities over the years. 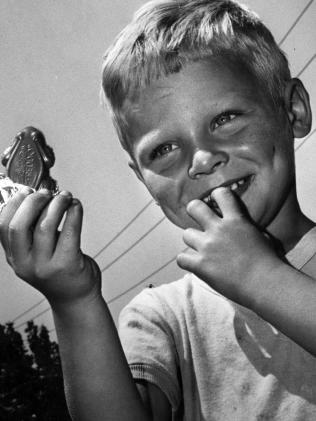 The Freddo Frog was invented in 1930 at the MacRobertson’s chocolate factory in Fitzroy, Melbourne. Macpherson Robertson was already famous for his confectionery products, including Old Gold chocolates and the Cherry Ripe chocolate bar. History records that he intended to produce a chocolate mouse, perhaps to capitalise on the popularity of Disney’s new animated character Mickey Mouse, who made his debut in 1927. However, so the story goes, an employee named Harry Melbourne pointed out that women and children were afraid of mice and suggested that a frog would have more appeal. Thus the Freddo was born. Initially, according to Wikipedia, there were four varieties: milk chocolate, white chocolate, half milk/half white, and milk chocolate with peanuts. That may be so, but by 1941 MacRobertson’s were advertising 12 varieties at a penny each. The Freddo of those days was shaped like a frog. It continued to be so at least until 1967 when the company was acquired by Cadbury, and possibly for some time thereafter. But at some point in the 1970s the MacRobertson’s name was dropped in favour of Cadbury. Perhaps it was then that the shape of the chocolate frog was changed to resemble the advertising character that had represented the brand for many years. Or maybe the change was driven by the demands of an international market. Freddo was launched by Cadbury in the UK in 1973 but the Poms were less than impressed. The product was withdrawn in 1979, but re-launched, presumably in brand new livery, in 1994. It was all downhill from there. Freddo now walks upright, wears human clothing and is a cartoon character rather than a frog. He’s been foil wrapped and plastic-wrapped and even undergone a glossy ‘facelift’ in the UK in 2009. And so to today’s version of Frog in a Pond. As a result of all these changes, instead of a frog floating peacefully in a jelly pond, Freddo is often seen with his head well above water. But even in this revisionist version of the dessert, the frog-like creature is usually unwrapped and IN the jelly. Not so at Barooga. Now hapless children are required to unwrap the Freddo and poke it into the jelly themselves. And what’s with the red and orange ‘ponds’? It all kind of kills the magic, don’t you think?